Noël Balen grew up sure of two things: what he wanted to do with his life—music and writing books—and what he didn’t want to do—all the rest. He has certainly achieved his goals. Noël is not only a musician, music critic, director and producer, but also a well-known author. His writing career began with a whodunit, and, to date, he has written over forty novels, along with short stories, essays and biographies. Perhaps his greatest international writing fame comes with The Winemaker Detective series of books that he co-author with Jean-Pierre Alaux. Noël and Jean-Pierre release two titles a year through publisher and translator Le French Book, and today have 22 titles in print. 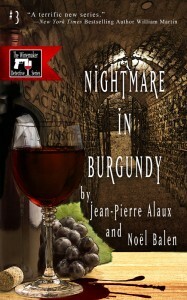 The newest, “Nightmare in Burgundy,” was released July, 2014, in both E-book and print versions. Click HERE for an excerpt. The mystery series is so well accepted that it is being made into a TV series, already popular in France, Belgium and Switzerland. Noël lives in Paris and took a moment from his busy schedule writing books, making records and lecturing on music to unveil, for Sweet Leisure, the mysteries of finding great wine bars in his hometown. Located in the heart of the Batignolles neighborhood, this is a wine bar for connoisseurs, offering over 500 different wines and spirits. The stone walls and comfortable armchairs add to friendly service and expert advice. The owners favor little-known estates and modest appellations, and have a number of pleasant surprises, including a Saint-Joseph from Courbis, a Cornas by Alain Voge, and a Domaine de Cébène from Faugères, to name just a few. These are perfect discoveries to accompany generous portions of pata negra. You can end the evening tasting aged rum from Peru, Mauritius Island and Martinique. That’s no surprise, with a name (ebéniste du vin) that literally means “wine woodworker,” here they love anything that is aged in wood barrels. The young chef Akrame Benallal has two Michelin stars and is one of the most over-talented cooks of his generation. He’s inventive, daring, sensitive and a high-flying technician who has already left his mark on France’s gastronomic landscape. He now has three addresses to his name on the Rue Lauriston, just around the corner from the Champs-Élysées: his restaurant (Akrame), along with a venue specialized in meat right across the street (La Vivanda), and finally, down the way, a wine bar called Brut. That’s quite a program for this refined man, and like everything he undertakes, Akrame hits the target with natural class. His wine bar equals his reputation. This is not yet a wine bar, but will be one very soon. Feisty Julien Arnaud’s wine shop has made the front cover of France’s prestigious Gault & Millau magazine, but this limelight has not gone to the man’s head. 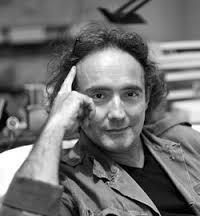 He is passionate about his work, which he does with enthusiasm and open-mindedness. In one sentence he may praise the merits of a Basque wine, and in the next rave about a grand cru from Bordeaux. I’m sure that when he starts serving food to accompany his wine selections, he will impose the same high standards and eclecticism. This is a man to watch. In the trendy Oberkampf neighborhood, you can still find a place with an authentic atmosphere, far from snobby posturing. At Le 11ème Domaine, the cochonnailles plate is impeccable, but go mostly for the selection of cheeses—particularly the goat- and sheep-milk cheeses. The owner will know how to find the Chablis or the Montlouis that will blow you away, or a Beaujolais that will surprise you. He’s a traveller with eclectic tastes who tears down the borders between Bordeaux and Burgundy. Prices are reasonable, which also contributes to the charm, making you want to come back quickly. Located in the former home of the Marquise de Pompadour, right near the Châtelet, you’ll find a vast selections of wines, many served by the glass. 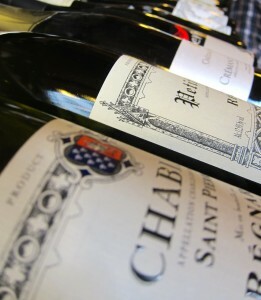 Whether you take a prestigious Médoc or a fine Saumur Champigny, the staff will always give good advice. The menu has a number of different food plates, and don’t deprive yourself of the absolutely divine truffled brie. In the end, if you are a curious gourmet and really let go, then the bill could be a little steep, but who’s counting? 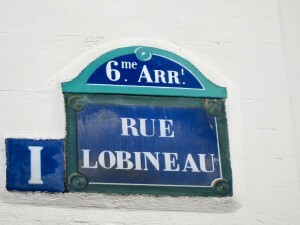 Here’s another address to visit in the Batignolles neighborhood. Some people go to this wine bar for its selection of organically grown wines and no-sulfite bottles, but that is not the only reason to make the stop. The down-to-earth décor, the truffled ham, the dried sausage, the smoked cheeses and the always very fresh bread (an important detail) are other motivations to go here with friends. Whether you live in the neighborhood or are simply passing through, this place feels familiar. 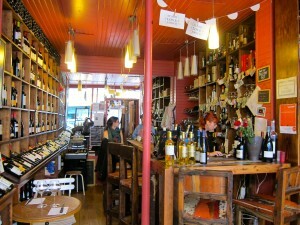 Le Siffleur de Ballons has good music, light-filled decoration, and an easy-going atmosphere—patience is a virtue here. 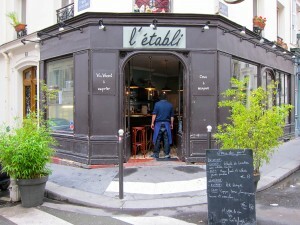 Most of the wines are served by the glass (something not that frequent in Paris), and you should follow the staff’s suggestions. The food plates are always well done and made with quality products. Here, you get good quality for a decent price. 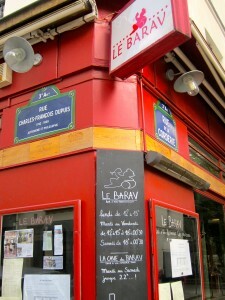 Just north of the Marais, Le Barav is on everyone’s don’t-miss list today. In fact, its success can lead to some frustration. Do stay, even if it’s noisy, crowded, inaccessible and almost unbearable if you are dreaming of a romantic tête-à-tête. You go for this slightly disorderly atmosphere, the people, the pushing and the space-sharing that the staff manage to channel and appease. Special mention goes to the rillettes, perfect with just about all the wines they offer. You go get your bottle at the wine shop next door. 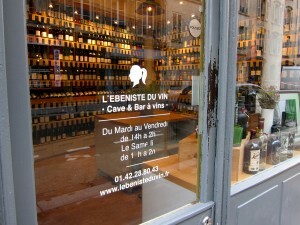 You cannot do a tour of Parisian wine bars without spending some time in Saint-Germain-des-Près. 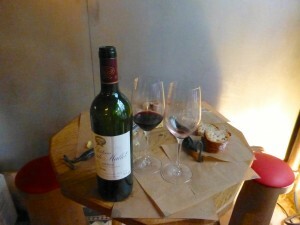 There, La Compagnie des Vins Surnaturels is chic, without being pretentious, intimate without being isolating. 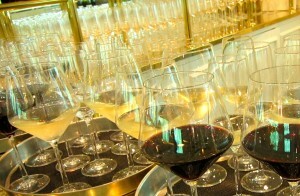 Here, you will be spoiled with one of the best wine lists around—it’s copious and very diverse. With such choice, don’t hesitate to talk to the waitstaff, who will be able to guide you based on your tastes, what you choose to eat and whether or not you want to leave the beaten path. Everything—pata negra, truffles, scallops, and more—is served with class. Reservations are necessary, as in so many of the capital’s top spots. 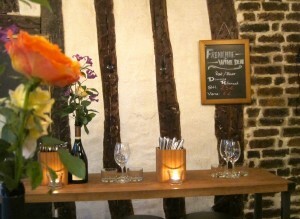 Frenchie is cozy, with a low ceiling, high chairs, wood beams and lots of charming decorative details. There is no need to reserve, but it is best to arrive around seven in the evening if you want to find a seat. The food is perfect, varied and changes with the market (blood sausage with apples, encornet and carrots, headcheese and girolles, and more), but that’s to be expected when you know that chef Grégory Marchand, whose restaurant is across the street, founded the wine bar. 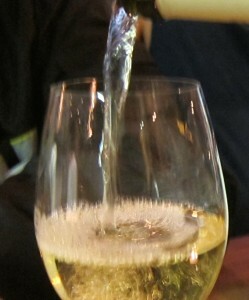 The wines equal the dishes, and everything here is served up without pretention, and with real hospitality.